Transform any moving vehicle into an appealing billboard by sticking these personalized automotive magnets. These outdoor car magnets are perfect for reuse and they cause no damage to the car surface. Do not worry about these promotional magnets chipping the car surfaces during road trips because our outdoor magnets are produced from the highest quality 30 MIL, UV safe stock material. Perfect for value building because our outdoor magnetic signs are crafted to perform under harsh situations! Our promotional vehicle magnets work perfect for car rental companies, mechanics, auto shops, car showrooms and many other automotive or regular businesses that are trying to build impressions on the go. Our selection features great designs that appeal with their style and classiness. 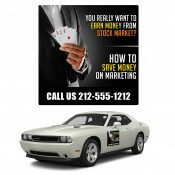 You can order any of these promotional automotive magnets to market your business with vigor and confidence. Over the years, you might have tried various marketing strategies to put your business into the limelight. The problem with most of those traditional promotional strategies is that they possess limited shelf life and their impact diminishes the moment funding stops. However, with automotive magnets, that issue is resolved effectively because these magnets offer long term shelf life than any of the traditional materials. 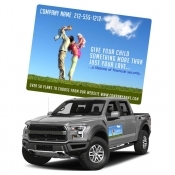 Promotional car magnets are inspired by outdoor traditional promotional materials which mean you can use these as moving billboards without actually spending millions on them. You can gift these vehicle automotive magnets during conferences, conventions and any other promotional giveaway occasions and encourage your clients to use them over their cars. 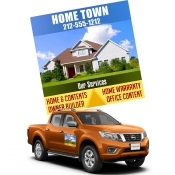 At Custommagnetsdirect.com, we offer a diverse collection of promotional automotive magnets in assorted shapes and sizes thereby making them affordable and ideal for consumer and business vehicles alike. You can easily select from our budget friendly selection featuring vehicle magnetic signs, magnetic car signs, car door magnets and truck magnetic signs. These customized magnets are developed to cover major portion of the car door or any other big or small vehicle. Our promotional outdoor magnets offer ample room to print company information or special sales information. These vehicle magnets are UV safe and perfect for summer advertising. Additionally, these promotional magnets are shock and water-resistant making them an apt choice for winter and rain, too. 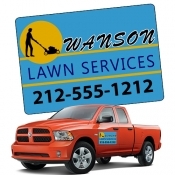 In short, custom vehicle magnets are perfect for a year-round advertising. We offer free art setup, free shipping, free online design proof and free full color printing with all our orders. To know more about price benefits, customization and other related aspects of these best-selling outdoor magnets, feel free to contact us at info@CMagnets.com or 855-762-4638 (Toll Free).